My first and epic fail at baking macarons. 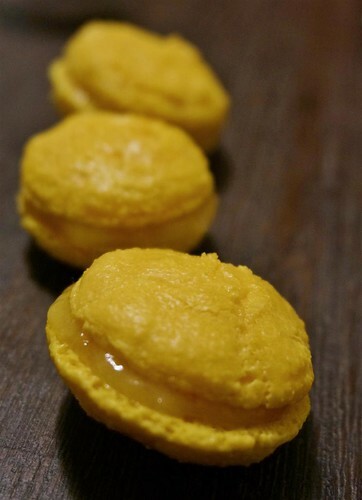 These were ugly looking passionfruit macarons. I am actually not a fan of macarons finding them too sweet, but I am tempted to give it another go just because I want to get picture perfect macarons. It was a week of firsts. 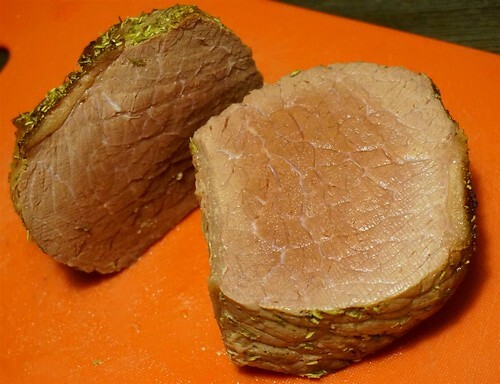 You would think with so many roast chicken dinners I would have roasted beef at some point but this was my first time too. 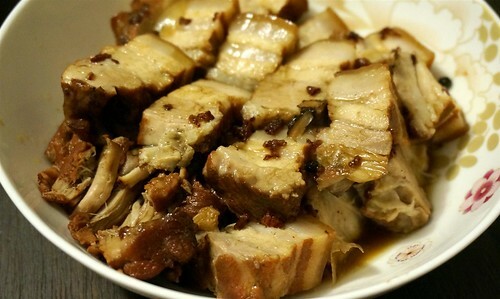 Braised pork belly with red rice, from my 2013 must cook list. With R working 6 days a week, Sunday is the only full day that we get to spend time together. We’ve started what I hope will be an ongoing ritual of Sunday brekkie :). Since last Sunday’s breakfast at The Old Crow was a big hit, we went back to the Old Crow again. 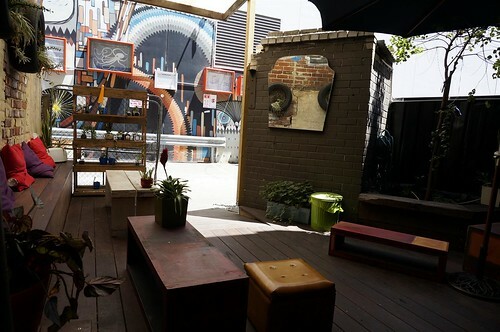 This time we sat in the ‘glass house’ part of The Old Crow, it’s nice sitting outside on bright sunny days but I still prefer the cool wooden interior. 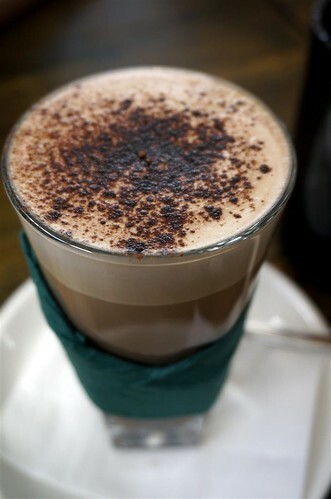 Sunday coffees are the best. A naughty little boy joined us for breakfast. One not so good thing about The Old Crow, not so family friendly with the lack of high chairs. 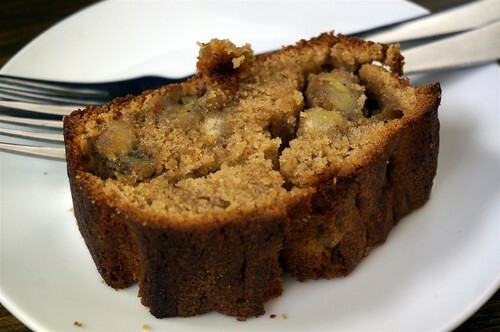 Packed banana bread which was rather like banana cake in texture. 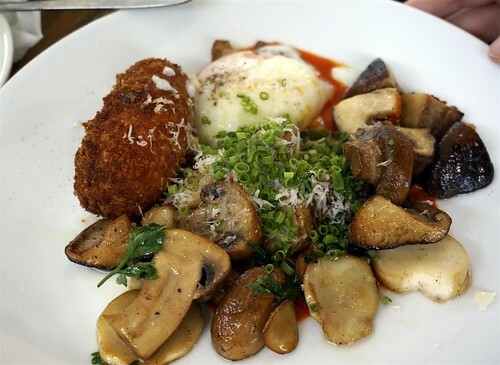 Jo’s mushrooms, provolone croquette, slow egg, red sauce ($19) was pretty good, I love cheesy croquettes and this was was nicely done. 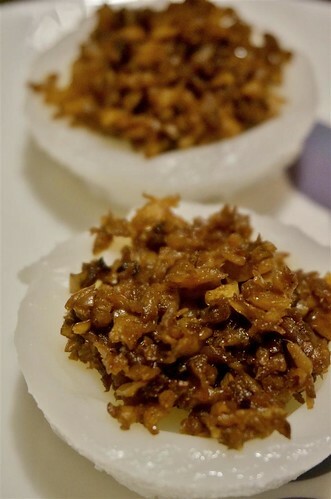 The slow egg was just right, softer than the texture of a poached egg but with the same runny yolk interior. 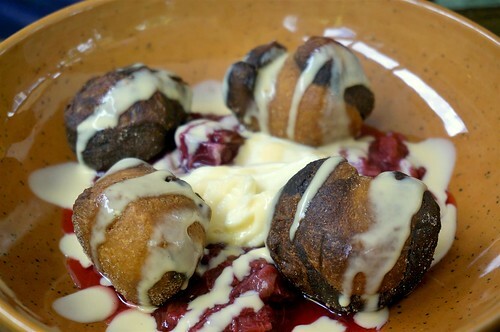 Doughnuts, buttermilk custard and rhubarb ($16). This was a poor choice for us, I usually steer clear of rhubarb desserts and probably should have this time. The custard and rhubarb mix was actually not too bad (not overly tart) but the doughnuts were not what I was expecting, they were rather hard on the outside and doughy and dense on the inside. Not my idea of good doughnuts. 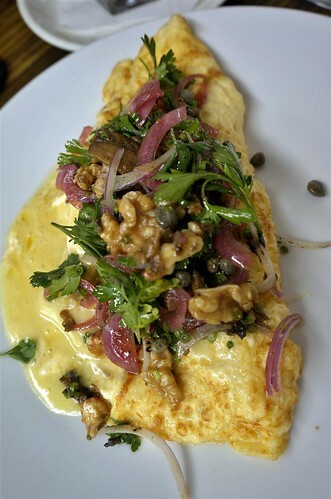 Omelette, brie and pickled walnuts ($16.50). The omelette was lovely and light by itself, but R found the pickles overpowering and didn’t enjoy this dish much. I think he will be sticking to the black pudding in future. Can you guess what pie this is? 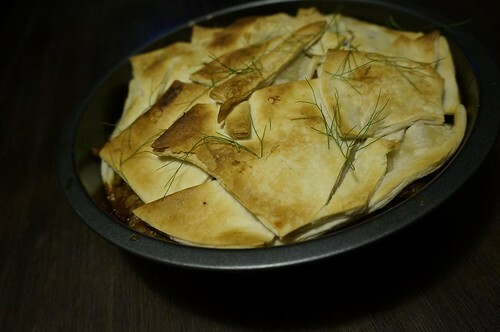 Not really a pie but a stew with a puff pastry lid. 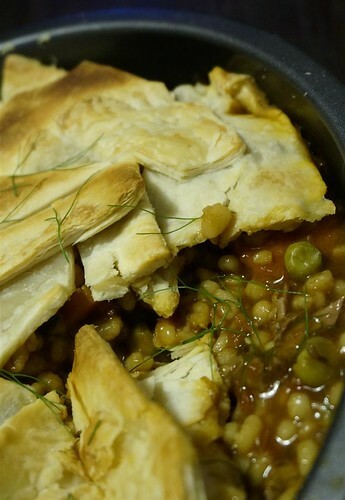 This was a lamb, pea and barley stew with lots of dill. I liked the added texture of the barley which when braised in the stew soaks up the flavours pf the stew rather like risotto. More suited for winter rather than summer but comforting nonetheless. 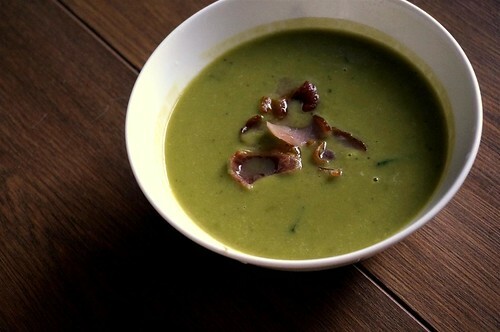 Pea and mint soup with added grilled bacon bits. 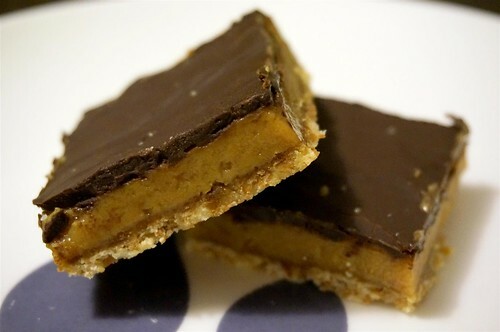 Chocolate caramel slices are popular Australian morning tea pastries and it was my first time baking them. Being lazy as usual, I was happy that I didn’t have to bring out the mixer. My colleagues at work liked it a lot so I will making them again. 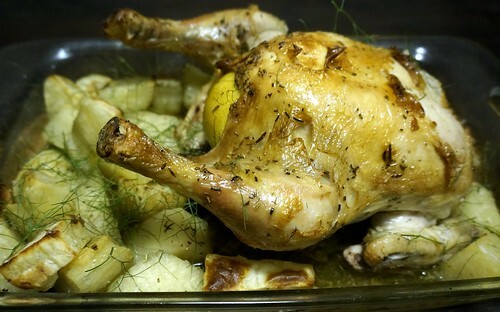 One more ticked off my 30 must cook recipes. I only have a month and a bit left to the end of 2013 so I had better start cooking more if I plan a make a dent to my list! It’s been a while since I’ve been into the Perth city so I ventured in alone during the past weekend. Maybe it’s because I don’t work in the city anymore so I really appreciated the new fun cafes and shops. 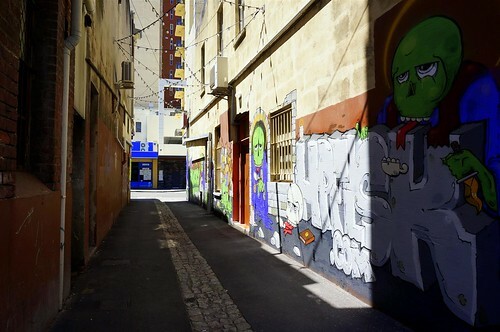 Who knew there was such vibrant street art in this hidden lane? This was my Saturday breakfast joint. 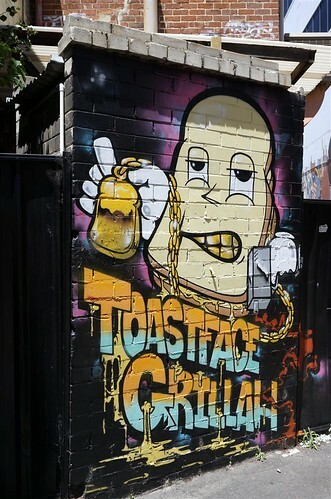 I love grilled toasts so the name Toastface Grillah immediately appealed to me. A cosy little nook is how I would describe Toastface Grillah. It was a hot Saturday but cool and relaxing in the shade. 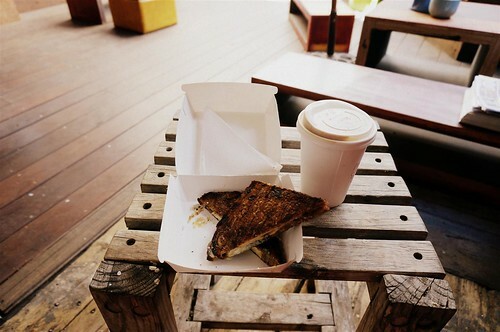 I enjoyed my me time with a Pear Grillz toasty ($9) with blue cheese, pear and lime chutney, a latte and the weekend papers. The toast was yummy but the clumsy daitaoha dropped lime chutney and blue cheese on my skirt :(. A messy eat but definitely worth it . 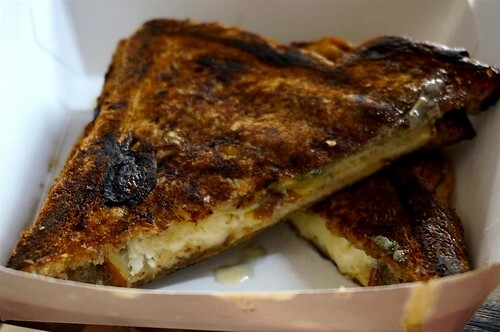 I would love to try all their other toasties but I doubt I’ll ever get the chance to go again. 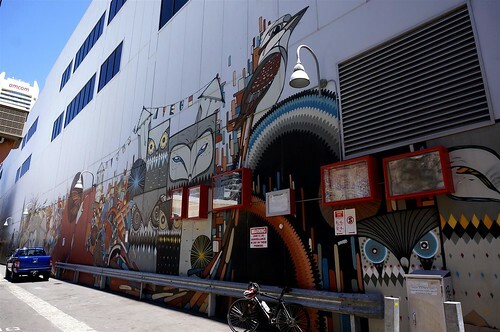 More gorgeous mural art in the city, I love the owls. The sleepy city is finally waking up. Ok, this is my new favourite breakfast place. 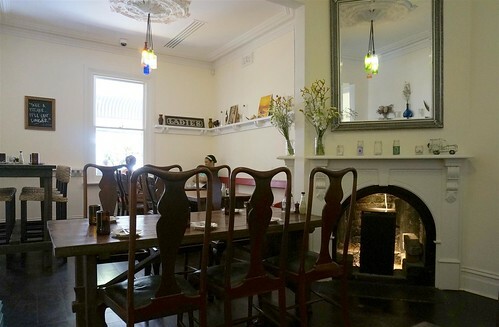 But The Old Crow’s lunch and dinner menu looks so good that I’m dying to go back for dinner too. I love the dark wooden interior and the lovely oldie music. 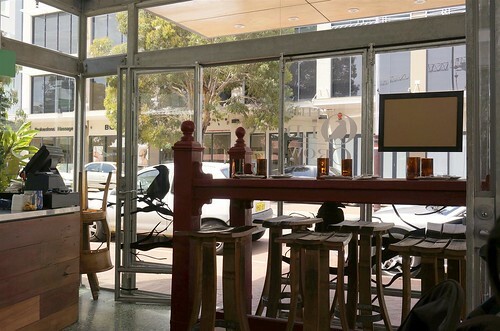 Just a few shops away is the ever popular Tuckshop Cafe which I reckon is overrated. 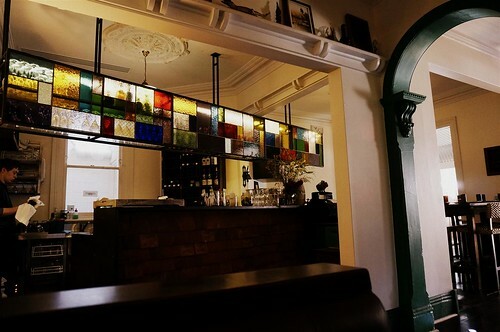 But I’m secretly pleased that no one seems to have discovered how good The Old Crow is yet because the quiet restaurant is just so cozy and comfortable. But surely it won’t last long? 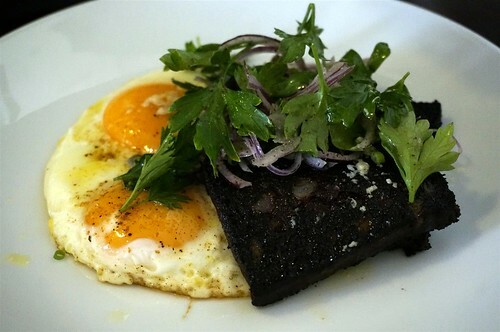 Black pudding, fried eggs and a side salad. Everything matched wonderfully well, down to the bits of red onion. A delight. Hotdog for breakfast? Why not? 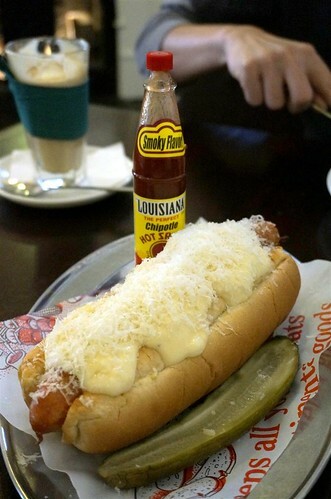 This house cheese kransky on a soft bun with jalepeno and hot sauce ($13) wasn’t your typical hotdog and was pretty tasty. I probably wouldn’t order it again because there are so many other yummy sounding things on their menu but it was still a novelty. 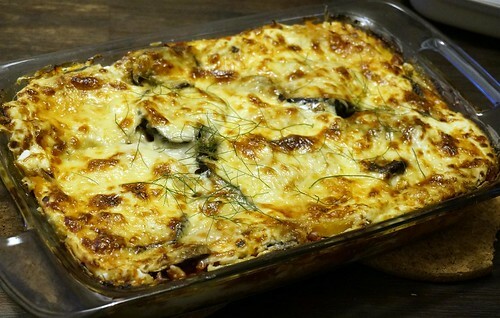 My weekend vegetarian lasagna with eggplant, pumpkin, mushrooms and ricotta. Tonight’s dinner of roast chicken with roasted purple sweet potatoes. 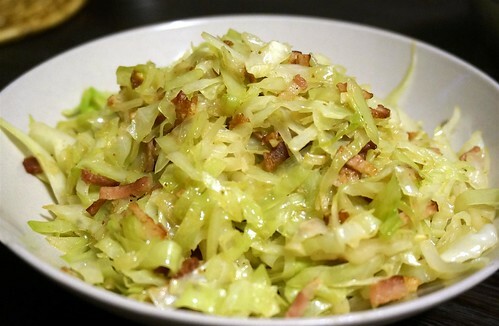 Stir fried cabbage with butter, Worcestershire sauce and bacon. 4 more days till the weekend.